Caleb Trotter, Sherwell, Plymouth, Devon; Christie's, London, 14 July 1883, lot 6, as 'Griffier' (10gns to Agnews). Lingelbach is well-known for his collaboration with other landscapists. He provided the figures in works by, among many others, Miendert Hobbema (1638-1709), Jan van Kessel (1641/42-1680), Phillips Koninck (1619-1688) and Jan Wijnants (1631/32-1684). 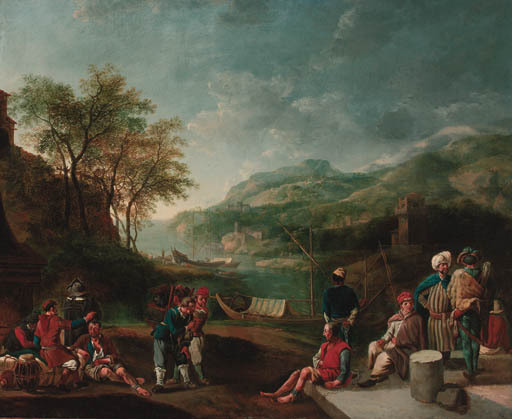 The present painting is the only known collaboration of Lingelbach with Jan Griffier I, who was of a youger generation.